On the eastern outskirts of Fielding in the Manawatu region you’ll find St Dominics Centre. Spread across 25 acres of rural surrounds, the Centre provides supported residential recovery accommodation for people living with mental illness. This is Corina Bond’s workplace where she is the Programme Coordinator. “For every negative thought you have, try to think of three positives to beat it,” Corina says. “We work with people towards their recovery by teaching them social and life skills,” Corina says. An experienced support worker, Corina’s background includes caring for people with intellectual disabilities and for the past four years she has focused on the mental health space. 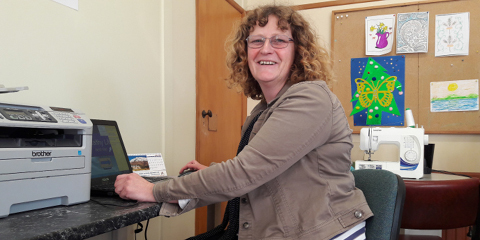 Now through the support of her workplace and Industry Training Organisation (ITO) Careerforce, Corina is on a mission to upskill herself through studying the New Zealand Apprenticeship in Mental Health and Addiction Support. “I have a lot of experience in this field, so it’s great to have the opportunity to achieve a formal qualification,” she says of the workplace training programme. The Centre is home for around 35 – 45 people at any given time, some of whom stay from a few days, other up to a few years. She says the Apprenticeship programme has allowed her to put her newfound learning into practice, improving her skills through on-job learning and finding herself able to support more complex conditions and situations. “The Apprenticeship has given me more understanding about some of our clients’ mental health conditions, and this learning has made it easier for me to support people,” she says. “I’ve learned so many new things that I could pass onto my clients, such as tools they can use to empower themselves.